This pork ribs sinigang is a variation of the original pork sinigang dish that uses tamarind as a souring agent for the broth. Guava is a good alternative to tamarind to make your broth sour and it is also a good source of vitamin c too. In case you don’t like to use pork ribs, you can use pork shoulder or pork belly which is suited for cooking sinigang and easier to tenderize. To cook sinigang na baboy; In a medium size stainless steel pot, boil some water slightly more than enough to cover the meat. While the water is boiling, put the pork ribs one by one until every piece of meat is in the pot. Then add the tomatoes and guavas and cook for about 30 to 40 minutes or until the meat is tender. Add the onions, gabi, siling labuyo, ginger, salt and pepper then cook for another 8 minutes. Then add the sitaw, okra and eggplants and simmer for another 6 minutes. Add in the kangkong and simmer for 1 minutes more. To see the rest of the recipe with the exact measurement of ingredients, continue reading. This pork ribs sinigang is a variation of the original pork sinigang dish that uses tamarind as a souring agent for the broth. In a medium size stainless steel pot, boil some water slightly more than enough to cover the meat. While the water is boiling, put the pork ribs one by one until every piece of meat is in the pot. Then add the tomatoes and guavas and cook for about 30 to 40 minutes or until the meat is tender. Add the onions, gabi, siling labuyo, ginger, salt and pepper then cook for another 8 minutes. Then add the sitaw, okra and eggplants and simmer for another 6 minutes. Add in the kangkong and simmer for 1 minutes more. Serve hot. 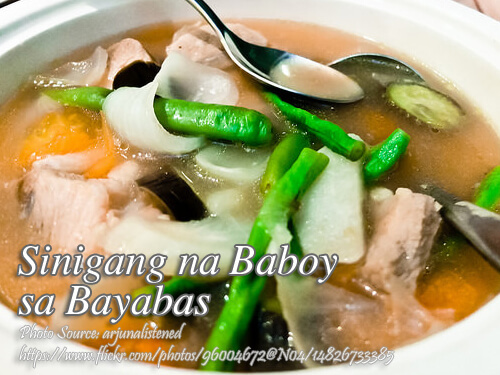 Love your sinigang sa bayabas recipe! Guava is my favorite fruit ! Hi Jane, glad you found this recipe! Cheers!